To purchase The Water is Wide, click on the Buy Now button below. Your payment will be processed through PayPal to Dennis Gallagher (Martha's husband). 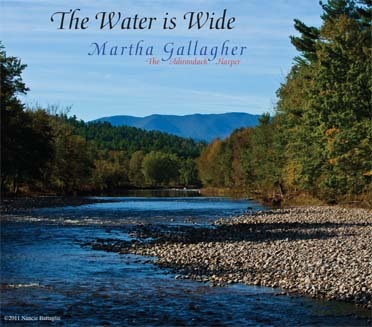 The Water is Wide was released Oct. 7, 2011, as a fund and awareness-raising CD for ongoing flood recovery efforts in the High Peaks region of the Adirondack Mountains of NYS; my home. The CD has exceeded our goal by raising over $14,000; 100% of proceeds has gone to the flood relief funds. MANY THANKS TO ALL WHO HAVE BOUGHT THE CD!! The Water is Wide CD is a collection of beautiful, peaceful, comforting music. Those who know my music know that I tend to explore a wide variety of musical styles and energy levels. This CD has the variety of styles, but is all very calm and soothing. It's what I needed while dealing with the aftermath of the flood; I figured that I was not the only one who might need some quiet music in their life.To purchase this CD click on the Buy Now button on the left or the CD cover picture above to hear samples and place online orders. Thanks to all who have donated to flood recovery efforts, as well as enjoyed the music.. Many thanks to Lane Gibson of Lane Gibson Recording & Mastering for his donation of services to create this CD!! This CD is still available at regional businesses. Also, please visit Adirondack Community Trust at www.generousact.org. Click here to listen to Martha's recent interview with Todd Moe on North Country Public Radio. Samradh, Samradh - This lovely trad. piece has Sue Grimm on both pennywhistle and Irish flute and my self on harp. Meaning "Summer, Summer", I thought this an ideal choice reflecting the best of a beautiful summer morning. Irene hit on Aug. 28, snatching away any vestiges of lazy Summer in our region. The Raindrop Song - I fell in love with my husband over this song of his, many years ago. He plays a 9-string guitar and I dance alongside on harp. I knew we were in for a long haul of flood recovery and I'm glad we can share moments of music with each other. The Water is Wide - Lovely trad. song of broken love. I didn't have the heart for singing about things broken, so I only sing the first two verses, which celebrate true love. I love the analogy of water and life and not going it alone. Vals Solitaire - this is the only piece on the CD that might stretch the definition of "peaceful". To me it has a darkish mystery and energy about it that reflects moments in life of action and change. Yet, after the climax, it returns to it's quiet yet not quite settled state. I love the interplay of harp and guitar. This work is by flamenco guitarist Maria Zemantauski and appears on her recording "Under the Lemon Tree". Early Morning - A song I wrote in college as part of an Orff assignment. It stayed with me all these years; the arrangement, with Sue Grimm on flute, was inspired by an early morning on the water. Spanish Dance - I loved this gorgeous piece, by E. Granados, the first time I heard Maria play it. The harp becomes guitar-like, following closely a 2-guitar arrangement, that I find quite peaceful. Oh Shenandoah - This song came into my mind mid-summer, as my Summer concert tour was to take us along the Missouri River and on through the Shenandoah valley. The Missouri River was still flooded when we were there, months after the flooding started. It was just mind-boggling to think of whole communities still living in water, in many places at least 3 feet deep! Little did I know what was in store for my community only a week later. We never did make it through the Shenandoah Valley, having to make up time to get to a gig. It seemed fitting to me to sing this beautiful song that is so river-based. O Carolan Medley - I first played this medley with The Chieftains, as a tribute to Derek Bell after he had passed away. This two harp arrangement features myself and Sue Grimm on Sidh Beag Ag Sidh Mor, Planxty Fannie Power and O Carolan's Concerto. Walking Through (This Town) - I wrote this song at the time of our town's bicentenniel. I love walking around towns as I see so much more and different things then when driving. I chose this song for several reasons; it's about my town, that was slammed by flooding from hurricane/trop. storm Irene, and the energy seemed right for this CD. But, I chose it especially because of the lines, "Gardens bloom behind old houses, hidden well; a stream flows in between." The gardens no longer exist; flowers, shrubs, trellises, and every particle of earth swept away, leaving only piles of rocks. The tiny stream flooded to 22 feet above flood level, became a raging torrent that ripped the back of the old houses off and left a now barren wash as wide as a 4-lane highway. I don't think I ever took a picture of this magical spot, tucked away where only a walking person would notice, but I captured a snapshot of it in song. It breaks my heart each time I walk by there now. After the Rain - It was almost a week after the flood before I was able to sit down at the harp. I felt completely empty, with nothing to say. I put my fingers on the strings and waited for a small eternity; nothing. Finally I played a chord; it was not the chord I thought I was going to play; it surprised me, so I moved my hands and played the chord I'd meant to. The transition from one chord to the next was so lovely and peaceful I played it again, then let it take me onward, peacefully. The first two chords you hear are those, the rest is in-the-moment, improvisation, as I let myself be one with the harp, the river, the universe.